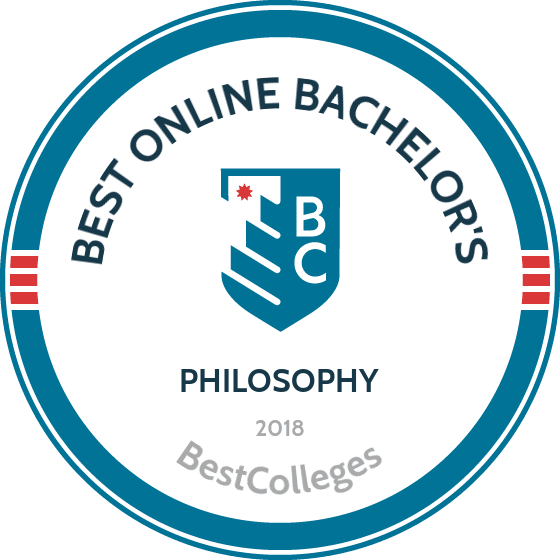 What Are The Best Online Bachelor's in Philosophy Programs? What Will I Learn in an Online Bachelor's in Philosophy? At its core, philosophy is the study of knowledge, existence, and the human condition. It's a discipline that interrogates the nature of reality and the ideas we use to represent it. As a student earning an online bachelor's degree in philosophy, you will learn to break down and synthesize complex ideas in order to form coherent arguments. While it may seem like philosophers are confined to the stuffy halls of academia, the skills you learn as a philosophy student are applicable to almost any career path. From courtrooms to corporate board rooms, analytically minded professionals are able to solve complex problems by applying rigorous methods of argument and persuasion. According to the National Association of Colleges and Employers, philosophy majors earn the second most out of all fields in the liberal arts and humanities, making it a career path that is both personally and professionally rewarding. UNC at Greensboro’s online degree in philosophy prepares students for careers in education, law, science, and government. Each UNCG philosophy student must complete a total of 122 credit hours, including at least 30 credits from prior coursework or an associate degree. UNCG’s online bachelor’s degree in philosophy features asynchronous learning; there are no set class times and students can complete assignments when it’s most convenient for them. The curriculum mixes theoretical and applied philosophy, with classes covering topics like metaphysics, medical ethics, and ethical issues in business. Students can also opt for a pre-law concentration. Beyond theoretical and applied philosophy, the program explores topics like ethics and religion. Students may choose to begin their studies in the fall or spring semester, and should submit their applications by July 15 or November 15, respectively. Well known for its successful Wildcats basketball program, UA boasts a major presence in online education. The school offers an online philosophy degree that features a specialization in ethics. Students in the program earn a total of 121 credits, including an extensive general education core that includes four semesters of a second language. In their major courses, degree candidates explore topics like ethics, philosophical history, logic, and metaphysics. Graduates who earn UA's online philosophy degree progress to careers in government, law, and commerce. The university also provides a number of resources for local students seeking to transfer their community college credits toward a bachelor’s degree in philosophy. In addition to transfer flexibility, UA's program features an asynchronous learning environment to accommodate students with outside commitments and a busy schedule. The online bachelor’s degree in philosophy at UIS features a 40-credit philosophy core, which students typically complete in about two years. These courses cover three different areas: core analytic philosophy, ancient and medieval philosophy, and value theory. Students may choose to specialize in core analytic philosophy or value theory. UIS has transfer agreements with a number of two-year and community colleges throughout the state. As a result, transfer students from other Illinois schools can seamlessly transition into the philosophy program at UIS. However, all applicants must meet the program's admission requirements, which include a statement of purpose, a writing sample, and letters of recommendation. Additionally, UIS gives priority consideration to prospective students who have a GPA of 3.0 or better. There are no application deadlines for the university's online philosophy degree. UNO's online bachelor’s degree in philosophy requires students to complete 33 credits in major courses covering topics like ethics, logic, and the history of modern philosophy. The curriculum also features classes devoted to specific philosophers, like Kant and Plato. With no mandatory in-person components, students can earn their philosophy degree online within four years. To graduate, degree candidates must complete a culminating capstone experience in their final semester. UNO’s program features an asynchronous format, where students access courses and coursework through Moodle and iTunes U. All distance learners at UNO pay in-state tuition rates, regardless of their state of residency. In applying to the online philosophy program, prospective students should submit scores from the ACT and SAT along with high school transcripts evidencing a GPA of 2.5 or higher. UofM Global's online bachelor’s degree in philosophy features a concentration in applied ethics and requires a total of 121 credit hours. Students typically earn their degree in four years, exploring the applications of philosophy by studying ethical dilemmas in ecology and medicine. UofM’s program also prides itself on diversity of perspectives, offering coursework in feminist and African-American philosophy. Students complete 30 credits of philosophy courses to graduate and select from coursework in political philosophy, ethics, religious studies, contemporary culture, and epistemology. Students with an overall GPA of 3.0 or above and at least a 3.5 philosophy major GPA may graduate with honors by defending a thesis after completing their coursework. UofM Global offers a variety of financial aid options to distance learners, including loans and grants. A bachelor's degree in philosophy is highly individualized. Students can study a broad range of philosophical, religious, and ethical perspectives from ancient Greek sophistry to Chinese Confucianism. Below is a list detailing the diverse courses possible with this degree. Bear in mind that each school's curriculum may vary. Introduction to Logic: This course distinguishes good reasoning from bad reasoning through analysis of an argument's logic and evidence. By breaking down complex ideas into their constituent parts, logic students are able to reach conclusions about the validity of various arguments. Philosophy of Religion: In this class, students investigate the existence of God, spiritual experiences, and the concepts of good and evil. Class material covers Eastern and Western spiritual traditions and explores their underlying moral assumptions in both historic and contemporary contexts. Ancient and Medieval Philosophy: Students in this course explore the history of both religious and philosophical thought throughout the ancient and medieval world. You will learn how ancient philosophers like Plato and Aristotle impacted the development of later thinkers such as Saints Augustine and Thomas Aquinas. Existentialism: In this course, students read and discuss the seminal texts of Kierkegaard, Nietzsche, Heidegger, and Sartre in order to ask philosophical questions concerning the nature of existence. Students will gain a clear understanding of the evolution of contemporary philosophy and the traditions that led to it. Science and Philosophy: As an examination of the history of science, this course explains scientific paradigms such as Charles Darwin's theory of natural selection and its impact upon modern society and philosophy. It also investigates the nature of science itself, the scientific method, and the evolution of modern science out of ancient philosophical methods. When researching where to earn your online bachelor's degree in philosophy, finding an accredited school is key. Because schools undergo a rigorous review process, accreditation guarantees the value of your education. There are two types of accreditation you should look for when applying to colleges: regional and national. While national accreditation is generally reserved for vocational and technical programs, regional accreditation applies to a broader range of institutions and sets a higher benchmark for academic quality. Along with the U.S. Department of Education, the Council for Higher Education Accreditation oversees regional accreditation bodies in the United States and provides a database of recognized schools and programs. There are also forms of accreditation that are specific to certain disciplines, such as medicine or education. While philosophy has no dedicated accreditation body, you should check with the school you're considering to verify that it is nationally or regionally accredited. This will ensure that your degree is recognized by potential employers and universities, and will also qualify you to receive federal financial aid. An online philosophy degree equips you with analytical skills, ethical reasoning, speaking and presentation skills, and writing competency. Such expertise naturally suits careers in business, government, law, and social work. The following list is just a brief overview of the many jobs open to a bachelor's in philosophy program graduate. Paralegals and legal assistants support lawyers by investigating ongoing cases, gathering supporting evidence, writing reports and drafting correspondence, and taking notes during trials and litigation. Paralegals can specialize in particular areas of law, and often work in groups to collaboratively build legal cases. Managers of social and community services work to improve the lives of local community members by strengthening social programs and advocating for the local community at the state and national levels. Groups in need of advocacy include children, the homeless, the elderly, students, and military veterans. These religious professionals support the faith-based needs of a community. While many philosophy majors can go on to become ministers or clergymen, additional education may be required to be eligible for ordination. For example, a master's in divinity is a standard prerequisite for many Christian denominations in the United States. These news professionals spread knowledge about current events by researching cutting-edge stories, interviewing key characters and analysts, and interpreting information to best explain serious issues for the general public. Positions exist in television, radio, and increasingly on online platforms such as blogs, vlogs, and internet channels. Technical writers work across multiple fields, including journalism, business, and the technology industry. They write how-to guides, answer frequently asked questions, review products or issues, and publish journal articles. Technical writers must be clear, concise, and capable of breaking down complex issues for consumers. Students who graduate with an online bachelor's degree in philosophy can enter a variety of fields that require analytical and problem-solving skills. Though specific salaries vary depending on location and level of experience, the five career possibilities listed below all carry entry-level salaries between $33,000 and $49,000 per year. No matter what online philosophy degree program you end up choosing, you need to figure out how to finance your education. The first step in this process is to fill out the Free Application for Federal Student Aid (FAFSA). This will determine your eligibility for grants and scholarships, federal student loans, work-study awards, and some private loans. Always prioritize grants, scholarships, and work-study awards over loans. However, if you need to take out loans, be sure to accept subsidized loans first since they will not accrue interest so long as you are enrolled as a part- or full-time student.